SISIS will be exhibiting at the Golf Industry Show (GIS) which is taking place in the Orange County Convention Centre in Orlando on February 5-6 2014, at booth 1979, with two new products - the Rotorake 600HD pedestrian de-thatcher and the Rotorake TM1000 tractor mounted de-thatcher which now features a new interchangeable reel system. It's fair to say that when you talk about thatch, many people say that you need to go deeper and deeper into the soil to remove it. Andy Walker, Field Support Manager for SISIS says that the most frequent question he is asked is how deep does the machine go? 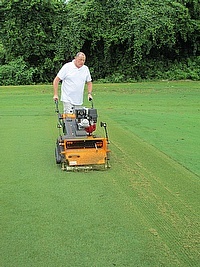 In his opinion, that is not the correct way to control thatch and here are some commonly asked questions he's asked to answer. SISIS are to showcase three new products at the 2013 IOG Saltex show, which is always a key event for groundcare professionals. A new pedestrian scarifier will be launched along with two redesigned products, the SISIS Dart pedestrian aerator and SISIS TM1000 tractor mounted scarifier. Following an extensive demonstration process, Leicester City Council has purchased a SISIS Supaturfman - an independently powered heavy duty aerator, for key maintenance tasks throughout the year on their five bowling greens. 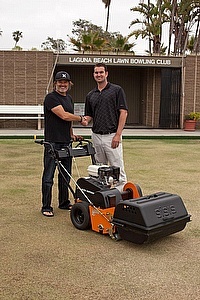 The SISIS Supaturfman is ideal for maintenance as a bowling green or cricket square aerator. When the time came for Andy Chetram, Facilities Manager at Central Park Stadium - the UK's longest greyhound track, to purchase new maintenance equipment there was only one choice - a SISIS Quadraplay. The 1.8m wide single pass maintenance system equipped with tilth rake, grooming rake and levelling plate helps remove paw prints from the previous race while simultaneously smoothing and firming the surface to provide the optimum conditions for the next race. 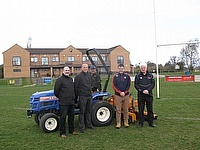 Dennis and SISIS, whose turf maintenance equipment is widely used by cricket groundsman at all levels, are delighted to announce a new partnership with the Club Cricket Conference. The SISIS Brush-Pro ride-on brushing system has been chosen by Leicester City Football Club for all regular synthetic surface maintenance at the club's Belvoir Drive training ground. The machine, specifically designed for maintaining synthetic surfaces, will be used on the full size 3G pitch as well as the 80m x 60m indoor pitch. Compacted, waterlogged golf and bowls greens in Norwich are now a thing of the past after local grounds maintenance provider, Lowestoft-based Waveney Norse, recently invested in a SISIS Autoslit pedestrian powered deep slitter. The SISIS Autoslit, ideal for fine or outfield turf produces excellent underground cultivation due to the angle of the tines, aiding aeration. 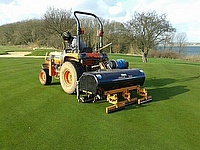 Angus Macleod, Course Manager at The Belfry, has selected SISIS Megaslit and Multislit tractor mounted deep slitters for maintaining the greens surrounds, approaches and fairways on all three world renowned courses. Dennis and SISIS have brought their spring 2013 series of educational events to a close with the recent bowls seminar at Meole Brace Bowling Club in Shrewsbury. 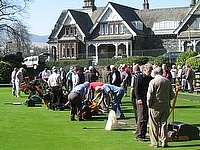 Committed to educating greenkeepers on how to maintain and look after bowling greens, the British manufacturer was pleased with the event which attracted more than 50 people including a mix of technical presentations and demonstrations â€˜on the green'. Dennis and SISIS scored a well-earned â€˜6' with over 150 delegates attending their recent Seminar at The Brightonandhovejobs.com County Ground. The programme for the day was kicked off by the company's Area Sales Manager, Robert Jack, who welcomed delegates and thanked the event's sponsors for their additional support.